That's the thing about climate change, it comes home to you. In our case, literally - the fifth night after my husband's departure, while the children and I were sleeping in the front bedrooms, the old tree next door gave way and smashed through the kitchen roof at the back. Brave and beautifully written, the stories that make up Here Where We Live chart the relationships white Australians have with the land and the Indigenous people they share it with. A woman moves her three young children south in search of rain; a girl throws her glasses in the river to avoid bearing witness to uncomfortable truths; a boy involved in an act of desecration becomes a man with an identity crisis at an Indigenous healing ceremony; a pair of desperadoes take lessons in love from a woman and the ghost of her lifelong partner. 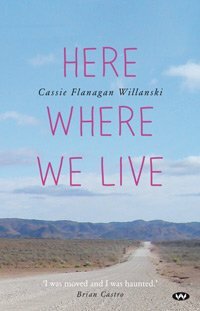 Cassie Flanagan Willanski's debut collection is about the invisible threads that connect us to old griefs, and the situations that give us courage for an uncertain future.